I'd have to say that it's been a good 5 minutes since an Urban Decay collection grabbed me as much of some of their past collections have done. Urban Decay is in fact one of my favorite brands, but I didn't even pick up their 2016 holiday Vice palette after seeing many dismal reviews. Usually, even if I see bad reviews for a product I want to try, I try it anyway, but I swatched that palette in store and while I thought it was ok, I didn't get it. The Jean-Michel Basquiat collection is a different story, I think this entire collection was something really special. The packaging of this entire collection is absolutely top notch, there was so much attention to detail in every piece. The outer packaging of the palettes and lipsticks is canvas which feels incredibly sturdy and just amazing quality. 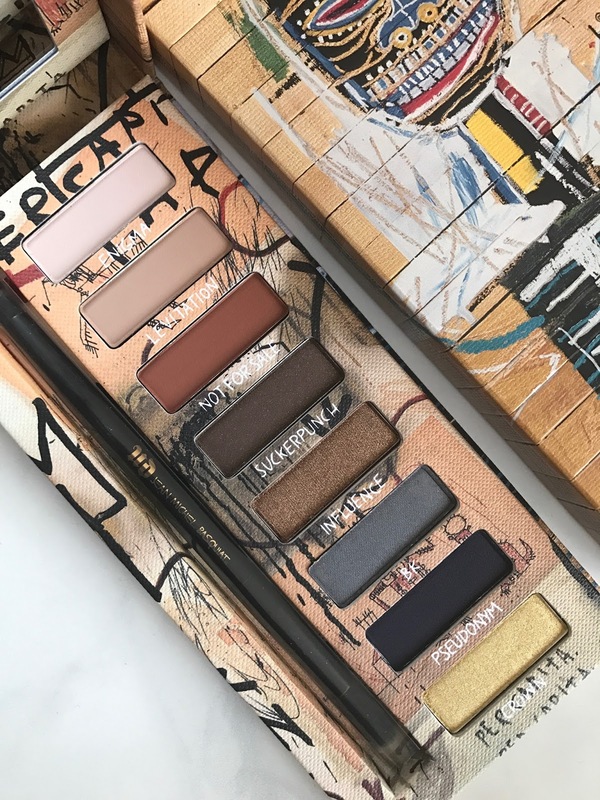 In the design aspect, the Urban Decay X Jean-Michel Basquiat collection gets 5 stars. But the inside and actual product of each item I bought, does too, incredibly enough. I wasn't expecting that these products would be as good as they are, so the collection exceeded my expectations for sure. Let's take a look at my favorite piece from the collection, which happens to be my current FAVORITE PALETTE, and I own a lot of palettes, so that says a lot about my love for Gold Griot. Gold Griot is the most neutral of the two pallets from the Urban Decay X Jean-Michel Basquiat collection. I remember looking at this pallet in person and thinking, "wow this is a really beautiful shade selection." I love that while most the shades are warm and neutral, there are few cool shades in here that can take everyday neutral eye to a smoky and super gorgeous look. For me a smoky eye is an everyday eye, so this pallet is virtually my perfect palette. Golg Griot is no longer for sale so this is not a full review, it's more for sharing my current favorite eyeshadow palette.. I have use this palette so much and I have used every single shade in here so I can tell you that each one blends well, they're all pigmented and just beautiful to work with. There was a point where I used this eyeshadow palette straight for about two weeks until I finally had to tear myself away from it because I have so many others I need to use too. It definitely is rare for me to find an eyeshadow palette in which I can use every single shade. I know that this pallet only has eight shadows, but when you know that you can use every single eyeshadow in a palette, even if it's only got eight eyeshadows, it's a winning pallet. My favorite eyeshadow in the entire pallet have to be Influence, I love this eyeshadow so much that I've said I could actually wear this every single day if it was the only shadow I owned. The formula is super creamy, it's incredibly pigmented and it is the most gorgeous dark bronze. On the eyes it looks 100 times better than what you see in these photos. This is an eyeshadow that I would recommend Urban Decay make in a full-size stat. Influence is hands-down the best shade in the palette. My second favorite eyeshadow is Not For Sale which is probably not a surprise. This is just a perfect red-brown eyeshadow and it's incredible how pigmented it is, you get the exact payoff of color that you see inside the pan with this eyeshadow. My next favorite has to be Pseudonym which I used to smoke out my lower lash line and to deepen out my eye looks. BK is really good for the same thing so I switch out between the two, but I really love Pseudonym and have even worn that by itself as a one-shadow look. And while I'm not usually a fan of yellow gold shades like Crown, this eyeshadow is absolutely beautiful. It is so pretty in person, I actually wear this as an inner corner highlight, and I don't even wear an inner corner highlight all the time but Crown begs to be used. Suckerpunch is the only shade in the pallet that swatched a little iffy but it seems to wear well enough, I haven't worn that on it's own but it looks like it will be beautiful for that. Like I said, I love wearing really smoky, dark eyes so this is exactly the kind of shade that I would wear on it's own with a lot of mascara. As you can tell I'm absolutely in love with Gold Griot. Being more of a bright shadow lover I was sure that the second pallet, The Tenant, would be my favorite, but this is the one the heart can't let go of. If you were lucky enough to get your hands on it I hope that you're enjoying it as much as I am. If you didn't get your hands on it, I would suggest keeping an eye out for it because sometimes you will see these items come back during a sale or maybe at stores like Marshals and T.J. Maxx. Gold Griot, I love thee!